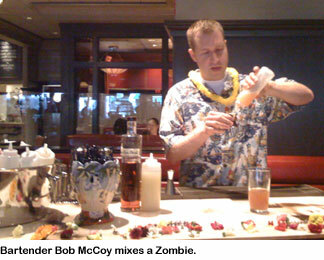 It’s always interesting when you have evening plans to start drinking Zombies at 2:00 in the afternoon. 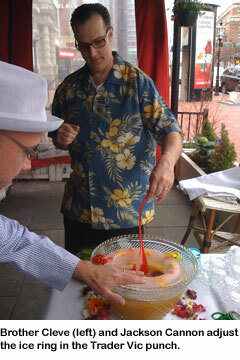 Yes, Zombie Punch, resurrected from a 1934 recipe once thought to be as swept away by the sands of time as Donn Beach’s original Beachcomber bar in Hollywood, was the first drink served at the Taste of Tiki party at Eastern Standard on Saturday. This is a remarkably delicious and potent drink containing a full four ounces of rum, one ounce being 151 proof! The other drinks on the menu were the exotic Cactus Flower, created by Brother Cleve for last year’s Tales of the Cocktail tiki block party, and another original, the Flying Dutchman, created by Eastern Standard bartender and tiki enthusiast Bob McCoy. 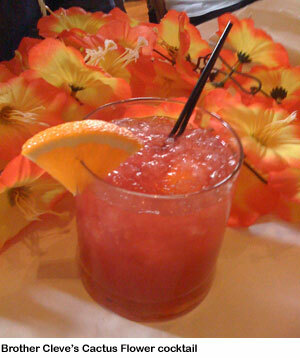 (Oh, and let’s not forget about the welcome tipple, Trader Vic’s punch.) Cleve and McCoy took turns speaking to the 50+ guests about the origins of the tiki phenomenon, and the cocktails, music and sometimes fabulous but often kitschy restaurants that were part of it. Luckily, there were egg rolls, coconut fried shrimp, roast pig and beignets to soak up some of that hooch. Many thanks to McCoy, Jackson Cannon, Molly Hopper and the rest of the Eastern Standard staff for putting together a terrific party. 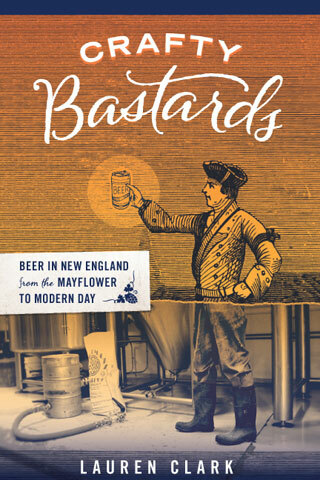 Thanks also to Mike Sullivan (aka Bargoyle) of the New England chapter of the Fraternal Order of the Moai for co-promoting this shindig with drinkboston. 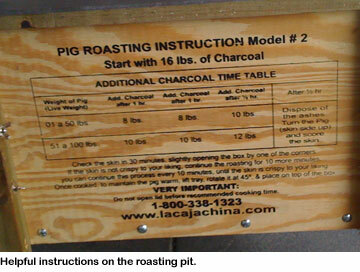 (Check out this group’s plans for a weekend-long tiki bash in Lake George, NY.) And a special thanks to Lorna Wilkerson, a Boston cocktail enthusiast who thought up the whole idea of having a tiki party at Eastern Standard in the first place. Build in a mixing glass and dry shake. Pour in a chimney (tall) glass filled with crushed ice and stir. Add more crushed ice to fill and garnish with a mint sprig. Build in a mixing glass and dry shake. Pour into a double old fashioned glass filled with crushed ice, add club soda, and stir. Garnish with an orange slice. Build in a mixing glass, add ice, and shake. Strain into a chilled lowball glass, no garnish. *For the infusion: Combine the peels of 20 lemons and 5 oranges with 1 1/2 liters of Batavia Arrack in a glass jar. Toast 20 cloves, 10 green peppercorns, and 5 cardamom pods over medium/high heat, tossing frequently until the aromas are released. Add to the jar, cover, and infuse for 14-19 days. What a fantastic afternoon!! 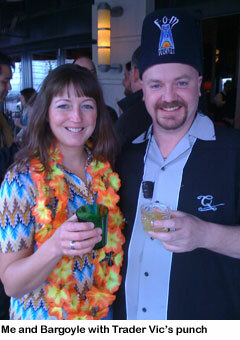 Great to see so many faces that I didn’t know, all digging the tiki drinks, food, & vibe. We’ll have to do it again soon. Boston NEEDS more tiki!! Kudos to you, Lorna, & the staff at ES for just a great afternoon! we really enjoyed ourselves, quite a cast of characters. loved the drinks so much i’ve already a couple of the books that Brother Cleve had. You’re right, Bargoyle. Boston needs one tiki bar at the very least. Our own Tiki Ti. Wow, that was fast shopping, Steve. Glad you enjoyed yourself. Ooh I’m so sorry I had to miss this! Looks like such a great party. Sorry to have missed you too, Cleve, if you’re readin’. Great event, I would love to see some sort of annual tiki event develop at ES. It sounds like they could have sold twice as many tickets based on the size of the waitlist, it would be great to do something bigger and use the whole restaurant if possible. I can’t say specifically ‘yes! It will happen!”, but I can say that Jackson and the ES crew was very happy with the turnout, the vibe and enthusiam of the attendees, and all were in a “let’s do it again” mood, with a possible evening date rather than another afternoon affair. Now that BeachBum Berry has unearthed the secret recipes of Donn Beach and his rivals, we know now that the real drinks, as served in the 30’s-60’s, were mighty potent, unlike the bastardized versions we drank in the 70’s-90’s. So “after 5″ may be better in terms of besotment. i thought the time was perfect for us. we were still able to hit up Drink and then Oceanaire for oysters. a wonderful escapist afternoon, for sure. definitely developed a new appreciation for tiki. I’d definitely be in trouble if there was a Tiki Ti in Boston. Mmm, Ray’s Mistake. Hopefully, I’ll be in town for the next such event (and get invited). Oh, but wouldn’t it be great if we had our own Tiki Ti? Graham, to get invited to drinkboston events, just get on the email list by contacting drinkboston at comcast dot net.